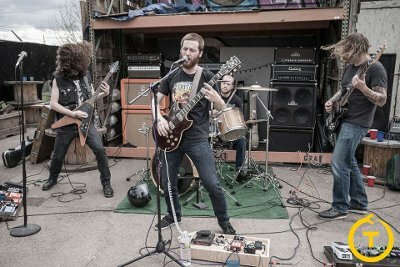 Taking cues from bands such as Pallbearer and High on Fire, Khemmis plays a very melodic, lead-driven form of Traditional Doom. Soaring clean vocals sail over lumbering riffs that range from gloomy, down-trodden passages, to epic mid-tempo sections. The more aggressive sections are occasionally accompanied by some shouts and grunts, adding a dose of Sludge to the, otherwise, relaxed sounding Melodic Doom. Empty Throne (Single) 2017 Decibel 7"
Fraught with Peril (Split) 2017 War Crime Recordings 7"